A couple of weeks ago I was invited to serve as judge in a best British cake contest at a spectacular (and spectacularly wet) Jubilee Garden Party organised by a band of Brits living in southern Alsace. I admit the invitation came as a bit of a suprise – anyone who knows me is probably aware that I really Don’t Do Cakes. I demurred, explained my cake lacuna, suggested loads of other people who I thought would be far better qualified (such as the lady from Lillimoo, whose cupcakes are wowing Basel marketeers on Fridays). They persisted. I capitulated – and then spent weeks fretting about how I, a total non-cake baker/eater, could possibly get myself up to speed on the subject. Clearly if I was going to judge others’ cake efforts, I had to bake one of my own. 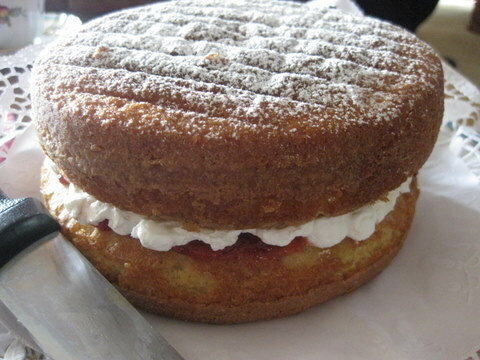 One of the categories was for a Victoria sponge, that great home-baked British standby tea cake. I can’t remember when I last made one, but I do have warm memories of Mum making them at home in Yorkshire, beating the living daylights out of the butter and sugar with a wooden spoon, folding in eggs and flour, pouring the batter into tins (the best part was licking the spoon – raw cake batter is sooooooooooo delicious, better by far than the baked cake), opening the door of the Aga and posting them in. They emerged golden and buttery, ready to be filled with home-made jam and dusted with icing sugar. This was the cake I would (attempt to) bake. I got down all my trusty classics from my groaning cookbook shelf (Good Housekeeping, Marguerite Patten, Katie Stewart…) and had a bit of a trawl on the Internet. Cake tins were assembled, buttered and floured. Butter and eggs were removed from the fridge to bring them to room temperature (supposed to stop the eggs curdling the mixture, ha! ), caster sugar was tracked down (sucre semoule round here, since you ask), cake flour (Type 45 or 000) was sifted with baking powder (for lack of self-raising flour), raspberry jam and whipped cream readied for the filling. My trusty Kitchen Aid mixer did a grand job creaming the butter and sugar (sorry, Mum), all lovely and white and fluffy like the books said. Then came the tricky part, adding the eggs. The recipes warned darkly that it was at this moment that the mixture might curdle. The resulting cake, said one sniffily, would not be a total disaster, but it would not rise as well or as evenly. Slowly, nervously, I added the gently whisked, room-temperature eggs to the beaten butter and sugar. They curdled. Okay, par for the course, never mind, I told myself bravely. I folded in the sifted flour and things came together again. Somewhat. Into the tins went the mixture, tops smoothed, and into the oven. They came out pretty well, seemed to rise fine and fairly evenly. I sandwiched them with jam and whipped cream and gave the finished cake a final nonchalant shower of icing sugar. We cut slices and munched on them thoughtfully in front of the telly, watching the parade of boats on the Thames as the rain came down in stair rods (both here and in London). Even my husband – who’s about as enthusiastic as I am about sponge cakes, i.e. not at all – conceded that it was really rather good. For a brief moment, I felt like I’d been making sponge cakes all my life. Back to earth – and much more importantly – I felt equipped for the task of judging cakes made by real experts (whose dazzling efforts you can see in the slide show below). Next: Next post: Does burying the stones/pits in your guacamole stop it going brown? try it, Jill! It is/was! Thank you for judging – and for being on TV Sue. And for preparing so well . . . lots of fun!!! A classic Victoria sponge should only have jam (preferably raspberry) in the middle and the top should be dusted with caster sugar.